Amidst of midweek rush, Share Food home cook extraordinaire brings to the table his secret recipe of Hokkien Popiah. His devotion to culinary perfection is truly inspiring. Dedicating his time and patience into every dish results in home cooked food that is of high standards and quality. Don't be surprised that some his dishes may take days of preparation because everything step and ingredient is handpicked, scrutinised and perfected before its final plating. A true advocate to delicious home cooked food. 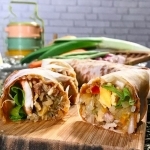 This time, we proud to present Jeffrey Yeo's amazingly yummilious Hokkien Popiah! Share Food home cook extraordinaire, Jeffrey Yeo brings to the table his secret recipe of Hokkien Popiah. Don't be surprised that some his dishes may take days of preparation because everything step and ingredient is handpicked, scrutinised and perfected before its final plating. A true advocate to delicious home cooked food. Buy it from him on Share Food mobile app!